Linterweb is releasing on its website Allingroups a new page containing lists of favorites Facebook groups concerning specific topics. Listed groups are the Facebook groups with most members, or groups we appreciate for some reasons. The topics are chosen according to the areas of interest of Linterweb employees. Britanny (this topic is important to us as our company is currently located in this region, in the northwest of France); video games; sports;; music; shared accommodation; Erasmus; online sales; cooking; car-sharing (while the United Nations Climate Change Conference will soon be held in Paris, in december 2015, this topic seems more relevant than ever); job search (while Linterweb tries to be a corporate citizen, we feel very concerned with the topic of unemployment); downloads; books; films; art and creation; concerts the latter four topics are important to us, as Linterweb has always been interested in and has always been supporting artistic creation, including performing arts); news; fishing; health and welfare; series. All these lists are displayed on the page Indicateur des groupes. We’all add new lists on new topics on a regular basis. If you have suggestions of topics or of groups that you tink we should add to our selection, please contact us at pmartin@linterweb.fr. Best regards, Pascal Martin, manager of Linterweb. Today I’m glad to present you Allingroups, a new service proposed by Linterweb. For quite a few years, here at Linterweb, we’ve been working mainly on Wikimedia oriented services, like Wikiwix, a Wikipedia oriented search engine, Okawix, an offline Wikipedia browser, or Wikiwix Archives, a service used for instance on the French, the Romanian or the Hungarian speaking Wikipedias, that allows keeping a copy of all Internet sources quoted in Wikipedia articles, so that they don’t get definitively lost, even if the initial Internet source has been moved or removed. We’re now working at something quite different, more aimed at the Facebook community: Allingroups, a Facebook auto-poster. Members of Facebook have the possibility to post messages on their fan pages or in their groups (groups of friends, of relatives, of fans, business groups… of which they are a member). If you want to post one message in one group or on one page, it is convenient. The problem begins when you want to publish the same message in various groups or pages. If you want to post the same message in ten groups or pages, you have to repeat ten times: go into the group or onto the page, write you message, post it, go to the second group or page, do the same stuff, etc. Well, with ten groups or pages, it’s probably boring but still possible, but if you’ve got several hundred groups or pages, you don’t want to spend all your day doing this, it would take up all your time! That’s what Allingroups is all about: saving you time! Allingroups allows you to save time by automatically posting messages to part or all of your groups or pages, while taking care to prevent you from being blocked or banned by Facebook quite restrictive publishing rules (that are in addition being reinforced those days). What’s more, contrary to most of other existing Facebook auto-posters, Allingroups doesn’t need to be installed on your computer: the program is run on our servers. As a consequence, your computer doesn’t need to be switched on and connected to Facebook while publishing your messages. So that, not only you’ll save a lot of time, but you’ll also save a huge amount of money and of electricity: just one of our servers dedicated to publishing all messages on Facebook uses much less energy than the ten thousand computers of our ten thousand current Allingroups users. At a time when the climate change is becoming an increasingly important concern, it is worth to be noticed: many small energy gains of this kind can, all together, amount to important energy savings for the planet. you click on the Save campaign button. And that’s all! Not very expensive, in my opinion : basically, one Allingroup credit allows you to post one message to one group or page. So 100 Alingroups credits allow you to post one message to one hundred groups or pages, or one hundred messages to one group or page, or two messages to fifty groups or pages, or five messages to twenty groups or pages: share your credits as you like among your groups and pages. In addition, you currently get 500 free Alingroups when you sign up, plus 200 more credits thanks to the following promo code: MATT LINTERWEB, that you will enter while signing up; plus other free credits through the affiliation link: once a person joins Allingroups through this link, your account will be credited with 200 credits and you will become their sponsor. When anyone you sponsor signs up to a plan, you will benefit from 10% of the credits that they receive. When somebody you sponsor sponsors somebody else, you will benefit from 8% of the credits that they acquire. At the third level, you will benefit from 6%, 4% at the 4th, and 2% at the 5th level. And you can also buy Allingroups credits on the My Credits tab. Our prices may vary in the future, but currently the price of an Allingroups credit is €0.01. Not even the cost of electricity if you did the publishing yourself. It means you can send 100 messages for €1. Considering the time and the electricity saved, I think it’s worth it! If you use Facebook a lot, you should definitely give it a try! You’ll save time, for you, and electricity, for the sake of the planet. While the United Nations Climate Change Conference will soon be held in Paris, in december 2015, this issue seems more relevant than ever. We and the people of Linterweb, we have always tried to keep the Wikipedia community informed of our ideas and our work concerning the Wikimedia projects, especially thanks to our blog http://blog.wikiwix.com/en/. We’ll keep on writing articles concerning Wikimedia on this blog on a regular basis. In addition, from now on we’ll publish all articles concerning Allingroups and the Facebook community on a new blog dedicated to Allingroups: http://allingroups.com/. at this time, the Italian language Wikipedia may be no longer able to continue providing the service that over the years was useful to you, and that you expected to have right now. As things stand, the page you want still exists and is only hidden, but the risk is that soon we will be forced to actually delete it. Over the past ten years, Wikipedia has become part of the daily habits of millions of web users looking for a neutral, free-content, and – above all – independent source of Knowledge. A new, huge multi-lingual encyclopedia, freely available to all, at any time, and free of charge. Today, unfortunately, the very pillars on which Wikipedia has been built – neutrality, freedom, and verifiability of its contents – are likely to be heavily compromised by paragraph 29 of a law proposal, also known as “DDL intercettazioni” (Wiretapping Act). This proposal, which the Italian Parliament is currently debating, provides, among other things, a requirement to all websites to publish, within 48 hours of the request and without any comment, a correction of any content that the applicant deems detrimental to his/her image. Unfortunately, the law does not require an evaluation of the claim by an impartial third judge – the opinion of the person allegedly injured is all that is required, in order to impose such correction to any website. Hence, anyone who feels offended by any content published on a blog, an online newspaper and, most likely, even on Wikipedia can directly request the removal of such contents and its permanent replacement with a “corrected” version, aimed to contradict and disprove the allegedly harmful contents, regardless of the truthfulness of the information deemed as offensive, and its sources. During all these years, the users of Wikipedia (and we want, once more, to point out that Wikipedia does not have an editorial staff) have always been available to review – and modify, if needed – any content deemed to be detrimental to anyone, without harm to the Project’s neutrality and independence. In the very rare instances it was not possible to reach a mutually satisfactory solution, the entire page has been removed. The obligation to publish on our site the correction as is, provided by the named paragraph 29, without even the right to discuss and verify the claim, is an unacceptable restriction of the freedom and independence of Wikipedia, to the point of distorting the principles on which the Free Encyclopedia is based and this would bring to a paralysis of the “horizontal” method of access and editing, putting – in fact – an end to its existence as we have known until today. It should be made more than clear that none of us wants to question safeguarding and protection of the reputation, honor and image of any party – but we also note that every Italian citizen is already protected in this respect by Article 595 of the Criminal Code, which punishes the crime of defamation. With this announcement, we want to warn our readers against the risks arising from leaving to the arbitrary will of any party to enforce the alleged protection of its image and its reputation. Under such provisions, web users would be most probably led to cease dealing with certain topics or people, just to “avoid troubles”. We want to be able to keep a free and open-to-all encyclopaedia, because our articles are also your articles – Wikipedia is already neutral, why neutralize it? From now on, (fr) Linterweb will be in charge of archiving the external weblinks of the Romanian speaking Wikipedia, to ensure that the content of those web pages remains available as reference of the article in the future, and this even if the true page has disappeared of the external web site. This service is now run, for instance, on several Wikipedia’s sister projects (the French speaking Wikisource, Wiktionary, Wikiquote, Wikibooks, …), or as well on projects of other languages (like the Hungarian speaking Wikipedia). Hopefully, this use of the Wikiwix archiving will extend even more, as this service has a huge potential usefulness: many references in articles contain external web links; when those links get broken, the readers can’t check anymore what the external web page says exactly, and the reference is often contested. So that part of the article gets lost, actually, as references are a very important part of the articles. The solution to this problem is to archive all external web pages linked to articles. The association (fr) ASRI (ASRI stands for Action Solidaire de Revalorisation Informatique en milieu scolaire) intends to provide pupils with an easier access to Internet and to computer resources. ASRI achieves its goals for instance by getting, upgrading and reusing old but nevertheless usable computers. As an other way of pursuing its objective, ASRI developed (fr) ASRI éducation, a Linux distribution based on Puppy Linux, and especially designed for a school audience. At Linterweb, we find this project very interesting. We are therefore very happy that ASRI is making available a package to set up easily our software Okawix. This Okawix package will allow the children to browse comfortably (fr) Vikidia, a Wikipedia-like website for children aged 8 to 13 years. I’ve already introduced you to Wikimarks, through two articles. In the first one I explained you that Wikimarks is a customizable search engine, that it is run by (fr) Linterweb, and that it makes it possible to perform searches on social network and bookmarking accounts (Delicious, Netvibes, Twitter, Google Reader, Identi.ca, Digg, etc.). I told you too how Wikimarks works, how you can settle your own Wikimarks search engine, and how to use it once settled. In the second article I described you only but a few of the numerous possible applications of Wikimarks. Today I’d like to provide you with a more detailed example of application: a Wikimarks engine searching on the official Twitter accounts of Google (there are dozens of them!!). First, to build the Wikimarks search engine was very simple: we’ve just had to set up a Wikimarks account, then to log in into the account, and to set up our Wikimarks search engine by adding all Twitter accounts of Google to the list of the pages indexed by our search engine. You can see and test the resulting Wikimarks-search engine here: http://wikiwix.com/index.php?lang=en&disp=!bookmarks%2FUser%2F200. Let’s see an example: you’d like to get the list of all web pages speaking of Wikipedia and that have been tweeted by Google. 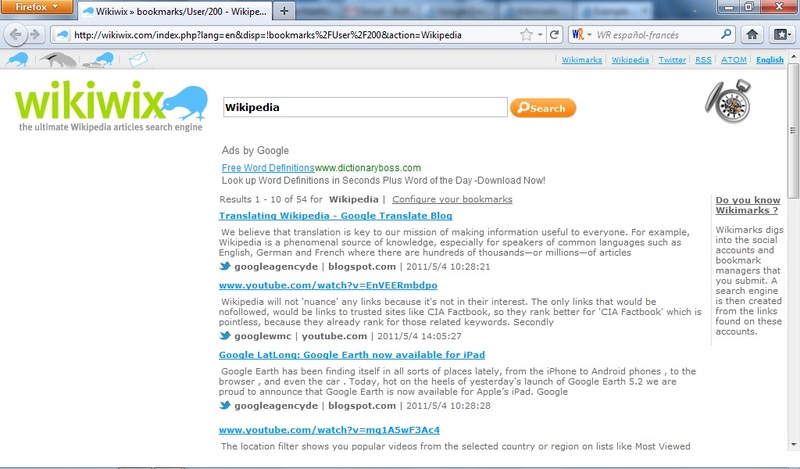 Very easy: type Wikipedia in the search box and click on the Search button to display the result page: http://wikiwix.com/index.php?lang=en&disp=!bookmarks%2FUser%2F200&action=Wikipedia. This way, you can easily know what Google tells about Wikipedia. The current version of Wikimarks is still a beta version, and a lot has to be done yet, but we hope you’ll want to give it a try and let us know your feed back on our blog. Well, people like me may be interested to learn that our company, Linterweb, has just released an Android mobile version of Okawix, its off-line Wikipedia browser. Indeed, as announced a few weeks ago, the version of Okawix for Android is now available. It is thus now possible to take Wikipedia, or any sister project, with you in the pocket of your jacket, on your Android device, and to read it anywhere, at any time, even without possibility of Internet connection (in the train, in air planes, in Sahara, in Antarctic…). The iPad and iPhone version should be released later this year. You can install for free Okawix for Android at this address: https://market.android.com/details?id=com.linterweb.lecteur or directly on the Android Market. We hope to read your feed back soon, for instance on our blog! 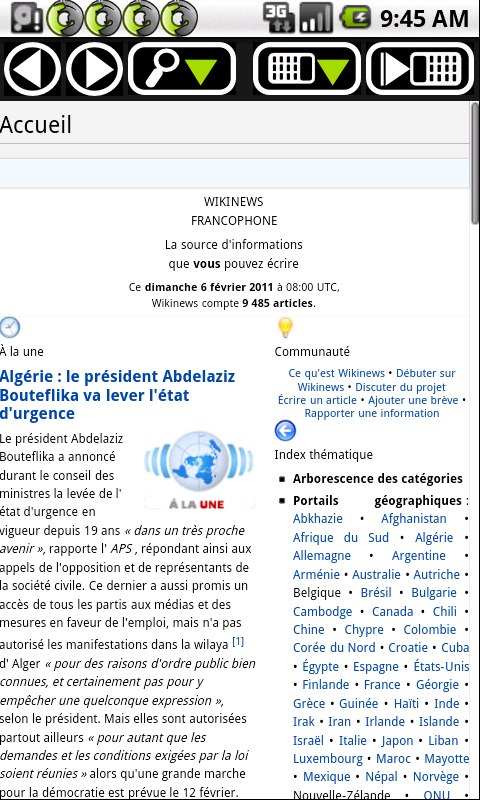 I told you a few days ago that our program Okawix, the off-line Wikipedia reader developed by the web company Linterweb, would soon be able to work the ZIM (fr) file format. We have got pretty well ahead with it, as the integration is now ready, and Okawiw can now accept ZIM files (but for now only for the PC under Linux version; not for Windows or MacOS). All those interested may watch and possibly improve the source code of our program, that is available at the following address: http://sourceforge.net/projects/okawix/. Since the initial release of Okawix, Okawix user have downloaded a total (server Okawix.com + BitTorrents) of around 14 Terabytes (!!!) of Wikimedia archives!!! If you would like to learn more about Okawix, we encourage you to visit and read our blog, especially the article “Introduction to Okawix“. We’re currently working at the integration of the ZIM (fr) file format in our program Okawix, the off-line Wikipedia reader developed by the web company Linterweb. It should be available pretty soon, probably in a few weeks from now. Well, if you would like to learn more about Okawix, we encourage you to visit and read our blog, especially the article “Introduction to Okawix“. And, if you feel like leaving us a comment under any article of the blog, we’ll be of course very happy to read it!